Qumran is the antiquity site near the caves where the famous Dead Sea Scrolls were found in the late 1940’s and early 1950’s. It is located on a rise 1 mi. [1.6 km.] west of the Dead Sea, 8.5 mi. [14 km.] south southeast of Jericho, and 13 mi. [21 km.] 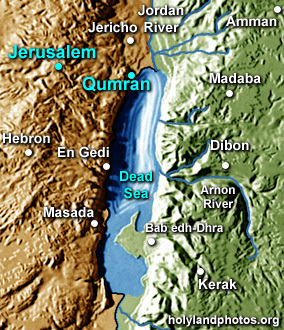 east southeast of Jerusalem. There were eleven principle caves that contained scrolls. These scrolls are now housed (primarily) in Jerusalem, in the Shrine of the Book. They contain some of the oldest known portions of the Hebrew Bible (= Old Testament) as well as many other extrabiblical documents. The total number of documents discovered in the caves near Quman is believed to be about 930, 230 of which are from the Hebrew Bible. Roland de Vaux, a Dominican father from the Ecole Biblique in Jerusalem, excavated the site in the early 1950’s. A variety of archaeologists have worked at the site since then.